Preparation for future employment in an ever-changing workplace is an integral part of everything we do at St Hilda’s. We aim to prepare our students to go on to further, higher education, or skilled employment with ease and a clear career pathway in mind, as we believe that this enables them to make a significant contribution to our society. The provision of high quality, impartial and relevant careers information, advice and guidance has never been more important than it is today. By using the Gatsby Benchmark, St Hilda’s aims to ensure that all students are equipped with the correct skills and knowledge necessary for them to investigate, research and enter their chosen professions. Students in year 7 – 13 follow a CIAG programme of student through their PSHE lessons. This programme of study lasts 6 weeks and covers the majority of the Gatsby benchmark. 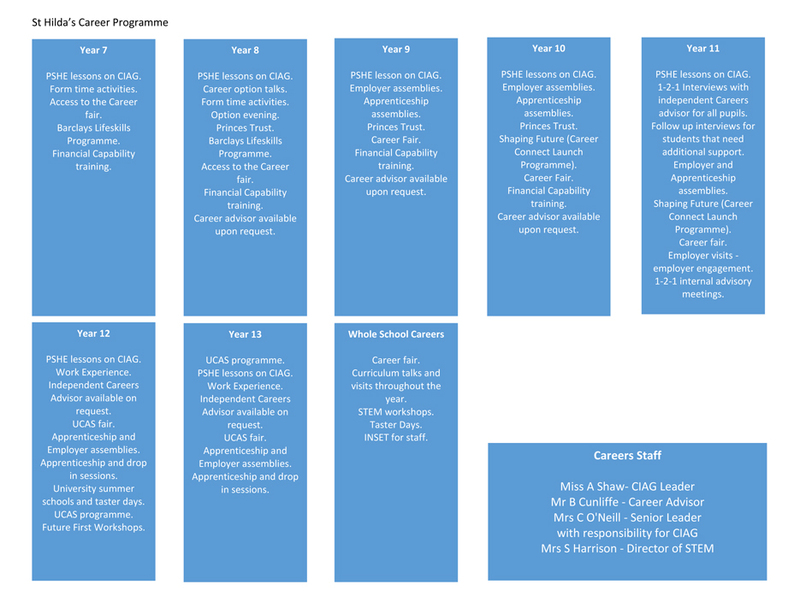 Please see the career programme outline. Impact of the careers programme on students. Each year we review destination data for students. This enables the school to understand our students’ career pathways and helps shape our careers programme and curriculum going forward. We work with a number of local businesses to ensure our provision is preparing our students for the ever-changing world of work, and we regularly review labour market information to inform planning. We undertake regular Student voice surveys to gather students’ needs and wants and to evaluate the career provision. Unilever are now open for apprenticeship opportunities for their September 2019 intake. The link to the website is below. Unilever also have some apprenticeship opportunities to start in March 2019. These opportunities are also available on their website.